What is everybody opinion of bill callahan? I have followed him for many years and i have never been excited about him. It goes back to his days as the head coach of Nebraska. I understand he is well respected but we have an all pro, pro bowler, and really good RT, yet we struggle with basics. If you look back at his time in Dallas, their running game exploded after he left. There could be many reason why, but if i look at the body of work since his day in Oakland, it does not stand out. You know what you might be onto something here. Our OL with the type of talent under achieves. Our only hole is LG and even so, it should be able to protect better or is it Smith holding the ball too long? D-line did enough, but they need a sack once in a while. Cam got into a little quick-hitting rhythm on nearly every possession, but D stiffened at the right times. We would have won by more with CT. Good to see Reed and tight ends picking up some slack. Props to the old gents — Davis and AP. Alex and Jay need to find ways of getting the ball delivered more quickly. A good W when things could really have gotten ugly. Thanks, Coffee. You’re a class act. And I think we owe you those wins against the falcons and bucs. Good luck the rest of the season (unless we meet again). Alex Smith, All Day and V Davis = our over the hill gang. Hate to say it, but Dallas is looking good today. I don't know how Alex is going to get the ball off with Dallas' pass rush. We are not doing a very good job at pass protecting. A lot of times he doesn't have time to go down field. He is not going to be able to check down all the time and beat Dallas. I do think our oline is very overated. Cooley had a problem with the way blocks were being coached on his last pod cast breaking down the saints game. Talking about BS trying to turn a defender instead of driving him back with power. We have huge stout mofos. Get them firing into people moving them. It's harder to get off a block if your going backwards. I think he is over rated. Nice win, I could have went without the Panthers getting inside the 20 on that last drive before turning it over on downs. Glad to be eating crow! Taste good after a win! Lots of improvement after saints game! We finally beat Cam Newton. I don't see anyone mentioning Doctsons name. Okay, he didn't have a 3 TD game, but he did catche multiple passes. Here is why Swearinger got the penalty for taunting at the end. Cam talking smack about going 4-1 before the game. Cam’s a great athlete but too much of a head case to form the heart of a consistent winner. 3 catches for something like 35 yards. About what Art Monk would do in a quarter. But you have to start somewhere I guess. While Norman, AP and Hopkins get a share of the games...the defense stoping the Carolina run game was big, Cam throwing 40 times isn’t gonna win them games. Cam is cocky he always has been, he's a good QB but will never be a GREAT QB, lacks the accuracy. We almost chocked that game away yesterday but victory Monday feels great. 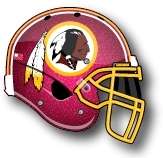 First thing I heard this morning was HTTR on Sirius NFL, it was awesome.